In many parts of the northern U.S., a forecast for a winter storm is standard course for the season. It’s only when the car can’t make it down the driveway anymore that it’s time to consider the weather bad. For people in other regions, the first hint of snow in the forecast can cause them to rush to the grocery store for bread and milk before a snowflake even falls. Whether you’ve got snowshoes or don’t even own a pair of winter boots, your home should be ready for a storm. Follow these recommendations to prepare your home for winter weather and reduce the chances of damage to your home or yourself in snowy conditions. Take a look at your roof. A big cause for concern when a winter storm comes is the potential for water damage. 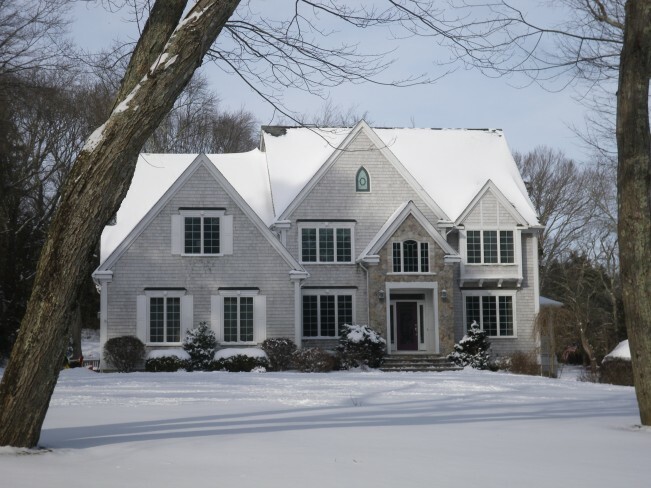 A leaky roof in the middle of winter can be difficult to fix, and with snow piled on top for much of the season, you may not notice until days, weeks or even months after damage has begun. Before snow is even in the forecast, do a ground-level inspection of your roof, says Peter Horch, owner of Horch Roofing in Warren, Maine. If you see broken shingles or prolonged wet spots that may indicate a leak beneath, be proactive and contact a roofer immediately to ensure any repairs are made before winter wind and snow damage can make it worse. “If anything looks out of order, call a professional,” Horch says. He stresses you shouldn’t get on the roof yourself for a closer inspection, and especially not if the weather is cold and there’s the potential for ice. Professional roofers will be able to take the right precautions, and if the weather isn’t favorable, they can do as much work as possible without getting on the roof to avoid injury. Have your heater checked. It’s a key step to prepare your home for colder weather, but if you haven’t had your heating system serviced in a year, it’s best to make an appointment for routine maintenance before a big storm. “There’s nothing worse than having your heater go out. Have that preventative maintenance done ahead of time,” says J.B. Sassano, president of Mr. Handyman, a national home improvement company based in Ann Arbor, Michigan. A malfunctioning heater during a blizzard can lead to frozen pipes, an increased chance of carbon monoxide poisoning and an all-around frigid home. Routine maintenance will ensure your system is running smoothly and reduce your chances for problems during the most inconvenient times. Own a shovel. It’s almost too obvious, but after the grocery stores experience a run on milk and bread, the home improvement stores typically see their stock of shovels go fast. When a winter weather forecast comes in, get to the store quickly or you may be left with a shovel that’s not up to the job of clearing snow. You may not live in an area that sees enough snowfall to warrant a snowblower or ride-on snowplow, but even if you do, a shovel is necessary backup in case there are technical difficulties with the more high-tech gadgets. Have the shovel at the ready inside your home before a winter storm hits. If it’s a blizzard, getting into a detached garage or shed can prove troublesome once a couple feet of snow have piled up. Be prepared for slippery surfaces. The most immediate problem you’ll face once a winter storm hits is how to get out and clear pathways without taking a spill. It’s important to know the difference between materials that will create traction on ice or snow and those that will help melt it. Steve Greenwald, president of Gaia Enterprises, which makes no-slip product Traction Magic and ice melter Safe Paw, notes it’s important to understand how people slip before determining the best way to combat it. “Ice is slippery, because on any sheet of ice at any temperature there’s something called free water – there’s a layer of water that’s unperceivable, but that’s what you initially slip on,” Greenwald says. When you need to get outside and begin snow removal during or right after a heavy storm, a no-slip product can help keep you upright. “You need something that grips the ice,” Greenwald says, noting Traction Magic’s usefulness in those situations. EcoTraction is a similar product aimed at reducing the slipperiness of winter surfaces. Other quick alternatives if you’re unable to buy a product specifically designed for winter weather scenarios include cat litter and sand, though Greenwald notes they don’t necessarily have the same long-lasting effect as a manufactured product. Road salt is another popular option, but it best serves as a snow and ice melter, and in temperatures below 10 degrees Fahrenheit is largely ineffective. Keep an eye on your plumbing. Freezing pipes are a big concern in cold weather, and a deep freeze or heavy winter storm could be the conditions to put just a little too much stress on your plumbing. You can take a couple simple precautions such as insulating exposed pipes and opening the cabinets in your kitchen, which will help the warm air inside the home stay close to the pipes in the walls. Turning on your faucets so there’s a slow drip will also help keep yourpipes from freezing and bursting. If during a winter storm you do see signs of pipes freezing in your basement or at exterior faucets, Sassano says you can use a hairdryer to try to warm them up, blowing warm air along the pipe to reverse any freezing already taking place. “That’s about the limit I would say a homeowner do,” Sassano says, noting you should stay away from a blowtorch or anything that gets much hotter because it could cause more harm than good.